David Bellamy and Jenny Keal, New paintings David Bellamy and Jenny Keal are fine traditional landscape artists, he in watercolour and she in pastel. Based in mid Wales, they travel far and wide for inspiration for their paintings, to show their work in exhibitions, and to share their skills with others in classes, demonstrations and painting holidays. Their travels in recent years have taken them from the Arctic to Patagonia and Canada to Oman as well as the four corners of the UK. David was born in Pembrokeshire and the couple return to the county often. On this occasion they are returning to open an exhibition of their recent paintings at the White Lion Street Gallery in Tenby on Easter Saturday. David's watercolour paintings are all done from first hand experience. His original sketches often show signs of being done in pouring rain, the washes frozen into intricate patterns, mud spattered, and one or two even blood stained. In his search for subjects to paint he has fallen over a crocodile in Kenya, sketched on dog sleds in Greenland, drawn moonlight scenes on a glacier, and taught Masai warriors to sketch in Tanzania. In Pembrokeshire he has abseiled down a cliff to reach inaccessible caves and sketched the cliffs from an inflatable seat out at sea. None of this is evident in his fine watercolour paintings which are held in collections around the world including those of mountaineers Sir Chris Bonnington and Doug Scott, broadcaster Sir David Attenborough, and the author Bill Bryson. In the Tenby exhibition most of his paintings feature Pembrokeshire from the coast to the Cleddau estuary and into the hills. Also showing are paintings of North Wales mountains and a few from the Arctic. Jenny has travelled with David on many of his recent expeditions and she has been introduced to all the nooks and crannies of Pembrokeshire by him too. 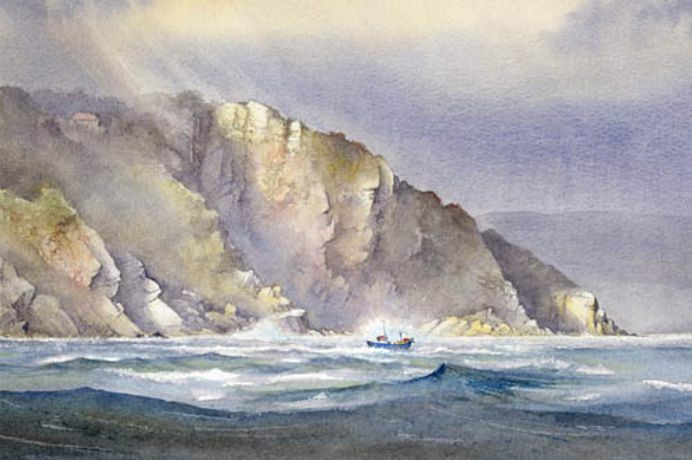 The inspiration for many of her paintings in pastel is drawn from the western fringes of the UK ; the history and geology of the landscape, the atmospheric effects of weather on the landscape and the way that man has influenced it. Farms and cottages within the landscape are a recurring theme. Jenny's paintings in this exhibition mostly feature Pembrokeshire but other locations include Dartmoor, the Lake District and the West Coast of Scotland. David Bellamy and Jenny Keal are also authors of books and DVDs to assist budding artists who wish to paint in watercolour or pastel. David has also written books about their travels and illustrated with his paintings. These will be available to view along with the paintings in the exhibition. The exhibition of new paintings opens on Easter Saturday, 30th March at the White Lion Street Gallery in Tenby, near North Beach and next door to the former cinema. Readers are invited to come and meet the artists that day between 11am and 4pm. It continues until 28th April, daily except Wednesdays, from 10am to 5pm.